Trisha tagged me for the Thinking Bloggers Meme. She has a fabulous blog which I love visiting as much as possible. 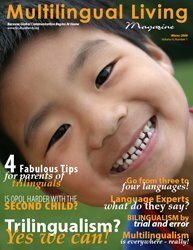 She is also a regular contributor to Multilingual Living Magazine with her touching essays about raising her bilingual children in Japan. The directions I was given are these: 1. If, and only if, you get tagged, write a post with links to 5 blogs that make you think, 2. Link to this post so that people can easily find the exact origin of the meme, 3. Optional: Proudly display the ‘Thinking Blogger Award’ with a link to the post that you wrote. 1. Momster - Irene's musings on life are fabulously touching, thoughtful, insightful and simply delightful. She never ceases to inspire me with her words and makes me want to live life just a little fuller. 2. Dinka - Sometimes funny, sometimes serious, but always a delight, Dinka's blog always gets me thinking! Her photos are also always an inspiration and fill out her entries so beautifully. 3. Between Pee and Kimchee - Jennifer is a writer through and through and her blog is a true testament to this. I delight in her literary entries and the way she is able to keep me captivated from beginning to end! 4. Mama(e) in Translation - Lilian is always full of insights and inspiration. She is a literature major from head to toe and you can tell. She doesn't let life go uncontemplated and delights us with her ability to look at it from yet a new perspective and to speak her mind! 5. Bilingual in the Boonies - Mami Hen's entries are always a pure delight. She has a witty edge to her entries that keep us readers laughing because we can relate completely! There are so many more blogs that I love to frequent (even though I am bad and don't take the time to leave a comment!) and which delight me with inspiration, laughter and contemplation. Thank you all for your magical words!